One of my favorite people in the world is turning four next month. He is our neighbor and one of my little guy’s best friends. He cracks me up. He is full of energy and life and I just love him. I have watched him grow from a newborn to a fellow who says, “Let’s play ‘Ready Set Go. '” Then you say those three words and he revs his “engine” and takes off. Bless him, I wish I had that energy. Even just five minutes a day would be good. Within our little corner of the world here, we have a street full of young’uns ranging from three to eight in this group that plays together. Their birthdays fall throughout the year, so it seems like there is always a birthday coming up for one of the children. As you might imagine, they have their fair share of–ahem–discussions as well. My almost four-year old friend came up with what I believe may be the greatest indication of where you stand with him. One of the children did something to frustrate him, and he told his Mama, “She’s off my birfday wist.” It doesn’t get much more serious than that folks. He is for real. But grace abounds. You can right a wrong and he’ll put you back on his list. Which is good. Seeing as how his birthday is next month, I’m trying to be careful and not take any chances. 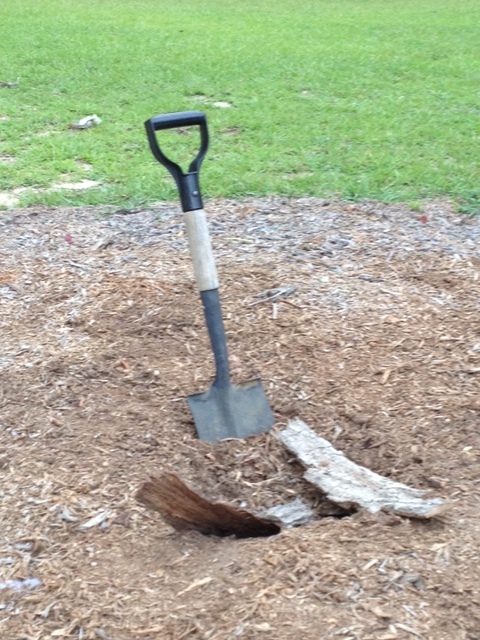 The shovel in our ground up tree stump pile…..that pool is really coming along! Two nights ago we were out back in our ground up tree stump pile. (Yes, that’s what it is, doesn’t everyone have one?) Our friend likes to dig in it with the shovel my Daddy got our Princess for digging years ago. He was digging for all he was worth–I think he might be digging me a pool, and I’m really quite pleased. He would toss the dirt behind him. On one toss he threw dirt all over his brother’s shirt. The next one he threw dirt all in the Princess’ hair. All was well because they knew he didn’t mean to. I really don’t think they forgave him because of his upcoming festivities, but then again, you never know. As his sweet Mama was gathering her two to head home, I took the shovel and dug a little out, almost without thought. Sure enough, my little bit of dirt flew onto my friend’s shoes. Oh dear. He was NOT happy. At all. Fearfully, I said, “Am I still on your birthday list?” He frowned and folded his arms across his chest and shook his head. I’ve got to tell you, I was just about devastated. As they started heading home, I followed behind him and told him he could play again the next morning. He laughed, and when I asked, I was BACK ON the birthday list. Huge sigh of relief. My friend and his precious brother, both my guy’s best friends, are moving. Such is the life of the military family. Saying goodbyes, packing up, moving. My heart is breaking. Our children have had their own Roxaboxen out here. I have loved this family and been loved by them. I will miss the way my little guy and their older son, both two when they moved in, prefer to ride the other’s Big Wheels. Every single time. I’ll miss their games of good guy bad guy, when the little brother, my friend, runs after them with his siren blaring. The three boys love to aggravate our Princess and her friend, and five minutes later they are all sitting together in my front yard playing “Duck Duck Goose.” They all call my three by our family nicknames, which is so precious to me. Their Daddy is the one who replaced the tire on our Princess’ bike when our Daddy was serving overseas. Another time he was the one who helped us figure out what to do with the lethargic little chipmunk who found his way into our garage. (We returned him to the woods where he is scampering playfully to this day–disagree and you’re not on my birfday list anymore.) Their Mama and I have had so many late afternoon visits standing in her front yard or mine, sitting on her back porch or my front one. When I got the call from Mama to come say goodbye to my Daddy nineteen months ago, she knew because she saw me leave my house so early and she KNOWS me. When Mama went in for her HospitalStay, my sweet neighbor friend cooked a huge meal (actually several in one) for all of us, even remembering my Aub’s and my sister’s special food allergies. And when our washing machine went out and we had no way to wash our clothes for Mama’s funeral, she was the one who said, “Bring them over here. I got this.” And she did. Washed, dried, and hung up ready to go. Neighbors and dear friends like that don’t come around very often. I will miss her sweet spirit that she shares so generously. When our neighbors moved in four years ago, one of the first things we noticed was a pineapple on their mailbox. Pineapples represent hospitality, and this is one family that embodies that a thousandfold. 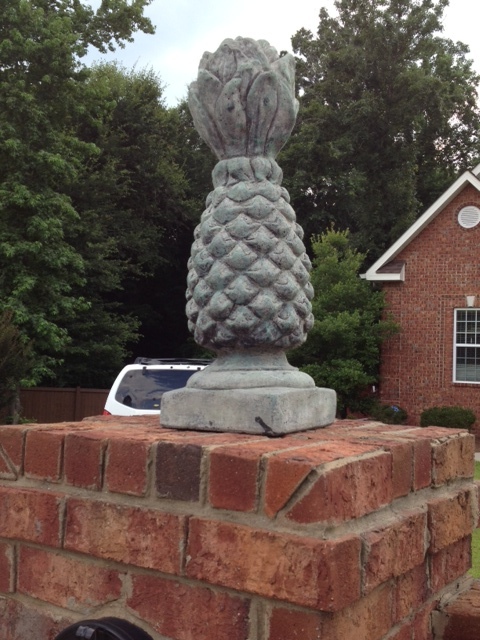 A week ago, I came home and the pineapple was on our mailbox. We are only keeping it until this sweet family returns to our neighborhood in a few years. But it was at that moment that the tears started flowing and the loss became real for me. Change and goodbyes, you are not on my birfday list. And I don’t think you will be back on it anytime soon. Today I took my oldest to college to register for classes. Wow. When did that even happen? Seriously, just yesterday I was up with her three-month old self for three hours straight because she wanted to play and would not go to sleep. And today? We’re registering for COLLEGE CLASSES? The world has gone insane. 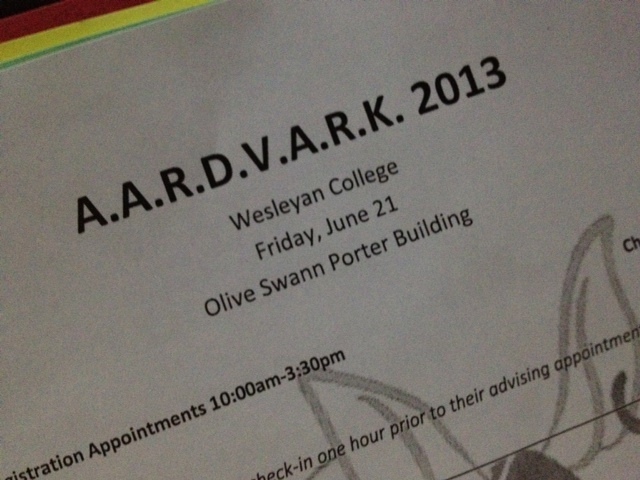 My Aub is going to my Alma Mater, Wesleyan College. I’m thrilled, but it was completely and totally her choice, which brings me even greater joy. She told someone today she’d wanted to go since she was five. I think back to her pulling out my yearbooks that were almost too heavy for her to tote, then crashing on her bed, flipping through pictures of those good ol’ days. In a year she will have a yearbook of her own filled with her first year memories. Again, wow. After we arrived, we sat downstairs in an area that used to be either the post office or the snack bar; I’ve gotten so turned around I can’t be sure. We were asked to arrive early and wait for her name to be called. They called her name and off she went. Without me. Big steps, people, big steps. For me, that is. She was fine. I sat and worked on my challenge I’ve given myself–not to fiddle with my cell phone while waiting. I’m trying to take in all around me and visit with folks when appropriate. As I sat back in the chair, I heard voices carrying from around the corner. It seemed to be a Dad talking to his daughter about her class schedule. “See…..this is what you want here. This will give you time to get up, exercise, shower, and then get ready for class…..” Dad said. Aren’t they cute? I mean, really, couldn’t you just hug ’em? I don’t know if I ever saw the family as it was starting to get crowded. But if I’d seen them, I would have had to resist the urge. Y’all are precious. You think you’ve got her days mapped out just how they should go, AND that they are going to go just that way. And they might. For a few days. I can remember days of 8:15 classes (good news, baby girl–now they’re backed up 15 minutes to 8 on the dot! ), rolling out of bed, hairbrush, toothbrush, grab my books and roll–arriving in class with about two seconds to spare. No breakfast, no exercise, no morning meditation. I am sure this was not how my parents would have suggested I prepare for my days of learning, and it wasn’t how I started off my college experience, but it was what it was. These young women have the opportunity to re-create themselves. They get to try, if they want, being the person who gets up two hours before class, jogs, showers, meets friends for breakfast, and then on to class. Or the person who wears yoga pants and t-shirts to class everyday. Or the person who has never really been athletic but joins her class soccer team…..or volleyball…..or takes a Zumba or water aerobics class. The person who didn’t study in high school can become the studious one whom everyone turns to for help in preparing for the mid-term. The young woman who hasn’t been on stage since her fourth grade class play can try out for the first play of the season and find her niche in Porter Auditorium. Though she may never have been very outgoing before, she might decide to run for class vice-president and win the election. She can begin college thinking she’s going to be a teacher but instead graduate with a Psychology degree and dreams of graduate school. So many doors are opening for these young women, they only have to decide which ones to walk through. And that’s what I try to remind myself. When I tell my girl about the adventures I had there, I want to remember she will create her own adventures. She may want to be on STUNT Committee or become a Peer Counselor and RA, but she MIGHT NOT. She may never set foot on the stage of Porter or put a toe in the pool. And that is okay. Did you hear that, Aub? It’s okay. I share these stories just to share them. No pressure, no expectations. Except two. Be who you are. 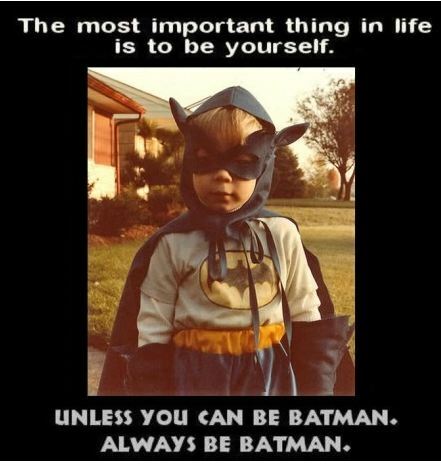 And (quoting Mama) be your very best self. Yeah. Pretty much the best advice. Ever. Tonight this is how I feel! Today the weather has been beautiful. Here it is the first day of summer and I must say, June, you are behaving yourself just fine. The breeze, the sun, the clouds, the less than normal temperature. GORGEOUS. Today I was treated to some unexpected visits with people I love–the crew and I made an impromptu visit to my Aunt’s, where, in the shade of the pecan trees, the littles played on the swings and Aub, Aunt, and I laughed and talked about a little bit of this and a whole lot of that. As the breeze drifted through the leaves I watched the pattern of the sunlight filtering through the trees change and move. Ahh, said my soul, I’ll take a double helping of this today. And everyday. Please. I also ran into my sister at the doctor’s office complex where we were all well but just taking care of prevention business with different doctors. She is a beautiful sight to see and her smile brightened my day. Our time together doesn’t come often enough, so this was a real gift–the hug I had needed but not expected. Later this evening I had a visit full of laughs when I ran into some of my favorite folks at my favorite coffeehouse. I am so thankful that all of these people were interruptible and had time for visiting, laughing, and hugs. Add into the equation our planned visit with some dear friends who are moving soon. We celebrated with a trip to the pizza place. Yes, that one. But both dads were in charge of the Game Room tonight, so one more reason to be happy. After we all got home the party continued as the children played between our yard and theirs, and my neighbor friend and I played “who’s older and had it harder growing up” game. Ha. His wife said we both sounded like a couple of old people. Ahem. Well, if the shoe fits….. So yes, a good, good day. THIS IS MY ONE HUNDREDTH POST!!!!! Yessiree, I am beyond happy happy happy. When I started back writing again in April, I set a goal to write something each day. I guess I didn’t think I would really do it, because I couldn’t believe it last night when the site said 99 posts published. Wow. I am doing this. I have surprised myself. It’s not just a dream anymore, I am writing. Whoo hoo! My soul is soaring, and I am overjoyed. So tonight is about laughter and stories and you. If it weren’t for you, would I still write? I hope so. But the encouragement you give me, the times you comment on what resonates with you and what doesn’t, that makes a world of difference. The times I see you out and about, and you say “Hey Girl” or “That thing last night? I heard that!”–those times give me the motivation to continue on. And for the special ones who say they usually start their mornings with their cup of coffee or tea and this blog–well, I am humbled and I thank you. When I’ve thought, well, missing just this once won’t matter, I thought of you and I got it written and I was glad I did. Thank you for the support and motivation. Love you. You know who you are. Thank you also for sharing your stories with me. I love that you do that. My Daddy could tell great stories, but I remember so many sunny summer afternoons, sitting on my Granny’s couch listening to Granny tell Daddy stories. Daddy knew how to listen too, and I’m working on being as good as he was. Mama was also a good listener. Family lore has it a wrong number called in the middle of the night, said she was sorry, hung up, and then called back to tell Mama her life story. For over an hour. And Mama listened. So please, I love hearing your stories. Your dreams. Your joys and your sorrows. Thank you for sharing them. I look forward to hearing more. Before I close tonight, in honor of 100 posts, I thought I’d share with you a few miscellaneous things just for fun. I’m the oldest of four–three girls and a boy. Daddy told me I was named after my Aunt, the baby sister whom he and my Uncle called The Little Terror. They both thought Tara (a twist on the pronunciation) would be a nice name and agreed the first one to have a girl would name her that. My cousin was a boy, so here I am. I don’t know how true this story is, but I like it, and I like it just fine that I’m named after someone so special. Peaches paid my way through college and during a small portion of my life put food on the table and a roof over my head. So I’m kind of a peach snob. Most folks choose to forgive me for that and move on. I don’t get peaches until after the fourth of July and I prefer to get the ones picked straight from the orchard. It just is what it is. I’m backroads and homegrown and a homebody. I’d rather bake than cook. I love old things and I have an obsession with blankets, bags, and sweaters. Mostly either handmade or from the GW Boutique. I think I may have warmth issues. (I’ve been known to “rescue” handmade blankets from the GW.) I learned to crochet from my third grade teacher on the playground at recess, and I learned to knit over a year ago from my friend Casey. I think crocheting is much easier than knitting, and my cousin, who is truly a talented artisan, thinks knitting is easier. Whatever. I love her anyway. The first thing I read in complete sentences was a note my Mama wrote me on pink paper that said, “IF YOU CAN READ THIS, YOU MAY HAVE A GLASS OF COKE.” That was no joke. You didn’t get Coca-Cola very often in my house. I’ve been reading ever since. And I’d rather have a book in my hand than on the Kindle, but I’ve read both and been quite happy doing so. I’ve been to the movies by myself. It was empowering, and no, I won’t tell you if I ate all the popcorn all by myself. I love my family, the ones I live with and the ones I don’t. One of my favorite places on earth is Blackberry Flats, where I grew up. I love laughing and country music. I grew up on Elvis and the Beatles and John Denver. We called Willie Nelson “Uncle Willie,” so I thought we might be related. I also like pop music. And I think Taylor Swift is pretty much a philosopher–“You don’t know what you don’t know.” Come on, that’s brilliant truth right there. I thought about closing out with a video of the song “Celebration” because that’s what I’m doing tonight all by my big girl self, sitting here at the counter with the laptop. But that would be predictable, wouldn’t it? And I try never to be predictable if I can help it. Life’s so much more fun that way. So I thought I’d close with a video that makes me happy every time I see it. (Thanks to my brother for this one.) And later tonight or tomorrow? When you can’t get the song out of your head? Well, you are very welcome. You’ve got to keep on keepin’ on….. Thank you all for coming along on this journey with me! I can’t wait to see where the next 100 posts will take us. Love to all. Today I surprised myself and my littles with a trip to a farm with friends. The farm was just over two hours away, traveling on beautiful backroads in a vehicle filled to the brim with friends, anticipation, laughter, and sharing of stories. I was traveling with our book group who meets weekly. I love these precious women. I love their smiles, their wisdom, their love, and the grace they give so freely. Today we loaded up with the children and went to a farm for a trip to reflect on the book Scouting the Divine: My Search For God in Wine, Wool, and Wild Honey by Margaret Feinberg, the book our group just finished studying. It was a beautiful day. It was overcast so it wasn’t too hot, and the rain held off until the end of our time together. I watched the eyes of my children as they rode in the buggy that Buck, their new four-legged friend, pulled along paths through the woods. Later Buck followed them around in the sheep pasture. I believe our Princess has caught the horse bug. My Buddy was the sheep magnet. A couple seemed to like him and came right up. It was a gift to see my two youngest whooping it up with their friends, peeking at eggs in a nest, smelling lavender growing in a bed, and resisting the urge to follow the turkey and roosters around the yard. 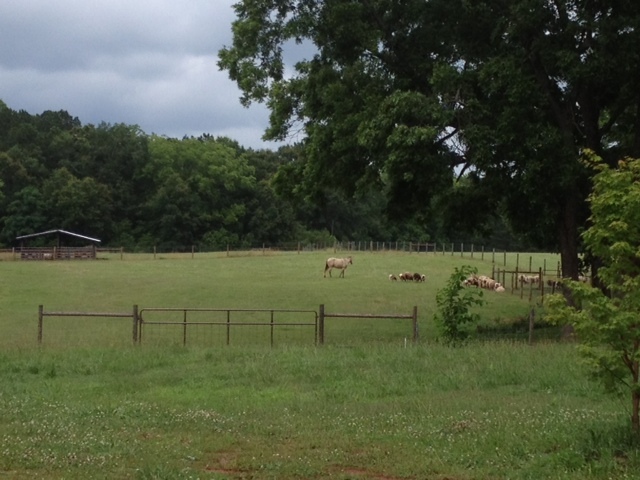 As we walked around the farm, I saw things that reminded me of England–the gates and the orchard wall especially. But mostly I missed my roots. Home. At Blackberry Flats. And at my Granny’s farm. I grew up sidestepping cow patties and crawling under electric fences. I was bottlefeeding a calf when I was 8 years old. We had a horse when we moved to Blackberry Flats a year later. We were never without cats and dogs scattering underfoot when we walked out the back door. I miss the animals. I miss the land. Oh I miss it all. The poetry in those words. I like to be about redemption. My soul cried out in resonance–YES! Me too! I want to be about redemption. I knew what it meant but so often the word is tied to religious meaning, which can get a bit confusing. So when I came home, I looked for the exact meaning and this is what I found in the dictionary. Redemption…..the act of recovering or atoning for a fault or mistake. Redemption…..rescue or deliverance. I’ve made mistakes. I have faults. Lots of them actually. The need for redemption is brought about by taking, by harming, by hurting. I have taken away from our planet and hurt my fellow people. Not always intentionally, but it has happened more often than I can bear to think about. I want to be about REDEMPTION. I want to be a part of rescuing what we’ve been given, all that surrounds us in our beautiful world, to be a part of the healing of hurting people who surround us, to make a difference in the brokenness. I too have been a part of that other, and I can tell you, it doesn’t feel good. I look around at what and whom I’ve been given–loaned if you will–and I am humbled. I am not worthy. And yet when I open my eyes again, it’s all still there. I can rush out and just ride the ride, not worrying about who or what is being affected. Or I can walk carefully and cautiously, paying attention to the ripples I’m creating as I do. Today the shepherdess shared with the children–and all of us–that it was best to walk through the pasture respecting the sheep and taking in all around us, thinking about how we were making them feel and being aware of that, sharing respectfully. I think that is what redemption is about–paying attention and taking care. Correcting wrongs made in the past. Rescuing. Recovering. Today I am thankful for the grace and patience of friends who allowed me to be a part of today and for the generosity of my friend who shared her family’s farm with us and set up the visit. I give thanks for reconnecting with my roots and for the stirrings within; I have to work harder to return to them. I am thankful for a day of getting lost in the beauty of the world around us, the sights, the sounds, the smells–and the beauty of precious simplicity. I crave authenticity, and today was all about that. I love the joy that today gave me and my littles, and I love the people who were a part of that. And I’m thankful for the poetry of the words I heard today. I am going to work on being about redemption a little more. A lot more. I think that may be one of the greatest gifts I can give my children and my world. And you know who else? Myself. Oh…..and the next best part of the day? When I got home, we still had these. 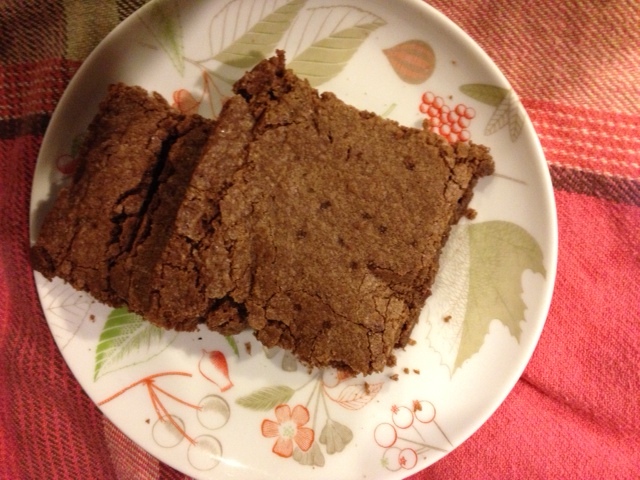 The brownies I packed for today–still intact! For the first time in what seems like forever, my littles didn’t ask for dessert when they finished their meal. Today I actually had one planned, it being a picnic and all. But on this day that my Princess said was her “best day ever in her whole life,” they ate their lunches and then wandered off to watch the turkey gobble around or to look at the sheep in the pasture or to smell the flowers blooming. Today, they feasted on a real treat–that of the beauty and nature around them. And that’s the sweetest dessert of all. In my travels up and down 247 back and forth to Macon a few months back, I saw this sign. That is not something you see very often, is it? But once upon a time….. Some of my fondest summer memories are of time spent with my cousins. Mama and my Aunt loaded all seven and then eight of us up in the Chevy II Nova (way back in the days before mandatory car seats and seat belt laws), and we headed up to Macon. The Museum of Arts and Sciences hosted movie mornings in the summer. I think it was every Tuesday and Thursday, but I can’t be sure now. On the planetarium walls I saw many of the old Disney classics–Cannonball Express, The Ugly Dachshund, Candleshoe, and Escape to Witch Mountain, among many others. Oh I loved the cool air and the comfortable seats in the planetarium. When we left the cool darkness, the bright sunlight and steamy, sweltering heat made us blink and immediately enveloped us on the short walk back to the car. After the movie, we often (okay my perspective, may not have been THAT often) went by the Krystal’s drive-thru and picked up burgers on the way home. Back then 25 cent Krystals were not so unusual. I can remember a head count being done–how many can you eat? was asked of the older ones and extras were added for the younger ones. I wonder what those folks thought when Mama and my Aunt ordered 35 or 40 Krystals at a time. With coupons. Good times. So many fun times spent together, especially in the summers. Pots of chili or spaghetti spooned out in numerous bowls. Playing Colored Ribbons or Cowboys and Indians in their yard or ours. The Barbie Wedding. Easter Egg Hunts and now Turkey Egg Hunts too. Movie marathons on the Video Disc Players. Remember those? The thing holding the movie was shaped like a record album. Remember those? Oh. Never mind. Suffice to say, great times then. Piled up in my Aunt and Uncle’s living room. Star Wars–the original movies. The Man From Snowy River. The room was so dark and the picture on their color tv was so bright. Almost like our own mini movie theater. I am thinking of my cousins tonight as one of the best cousins ever has her birthday today. And in the past week my own children have spent lots of fun times with some of their cousins. And it’s also my niece’s birthday. Yeah, I’ve got cousins on the brain. And family. And Krystal’s. But that’s another story. I am lucky to have a close family, where second and third generations out, we gather and love each other, share laughter and tears, and have each other’s backs. If I am in a bind, I know who to call. Tonight I am thankful for my cousins, who know me and oddly enough, seem to love me anyway. I am thankful for my children’s cousins, and second cousins, and third, who brighten their lives and mine–with their creativity, imaginations, sweet spirits, and downright fun outlooks on life. I give thanks for Mama and Daddy and all my aunts and uncles who made family a priority and made sure we had these great memories to turn back to on days like today. And I’m grateful to Rody Davenport Jr. and J. Glenn Sherrill. 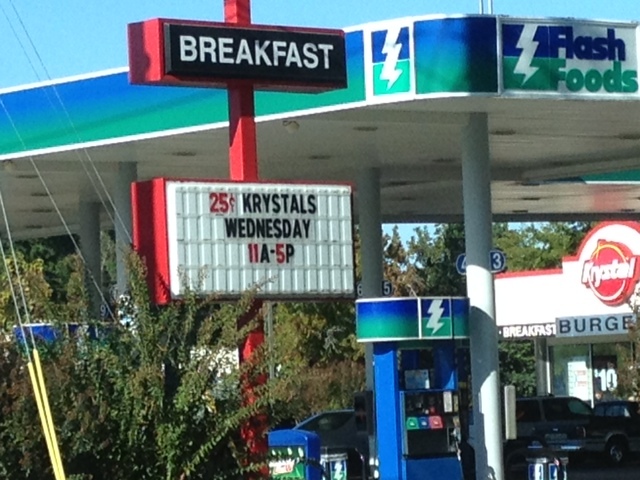 Oh, they’re the folks who invented and founded Krystal’s. I don’t eat their burgers as often as I used to, but I still love them and the memories they carry with them. 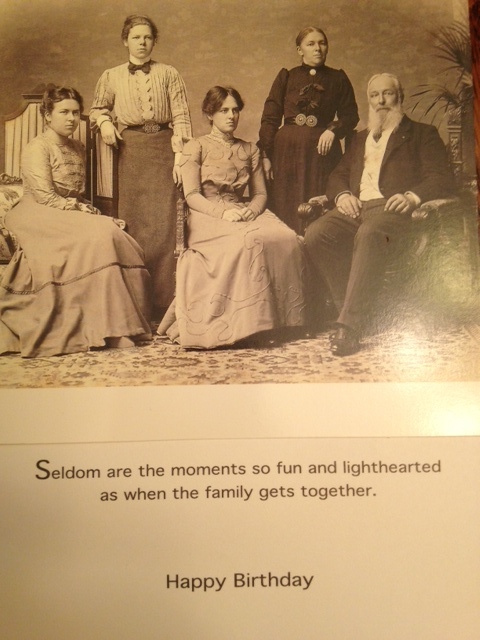 A Hallmark card I got years ago–yep, this is how we roll….. The current world record for eating Krystal burgers is 103 burgers consumed in 8 minutes by Joey Chestnut, set on October 28, 2007. My first job was at our small local library. I started on a Tuesday, the day before I turned fourteen. I worked Tuesdays and Thursdays through most of my high school career until we moved from the one room library at City Hall to our new building. Tuesdays and Thursdays from 3:45 to 6:00 as I recall. I was responsible for checking books out, checking them in, re-shelving books and whatever else the librarian asked me to do. When nothing else needed doing, it was my responsiblity to “read the shelves,” which meant I checked to make sure that all the books were in their correct spot. Later I even did some of the storytimes for the young ones during the Summer Reading Program. I had been working there almost a year. My birthday was coming up. On a Thursday that year. I had already figured it out in my own mind that I would just switch up and work Tuesday and Wednesday so I could have my birthday off. Made sense, right? I happened to mention my game plan to my parents. Ahem. They were not so fond of my game plan. Their position was I had a job, I had a scheduled time to be there, I needed to be there. “You might as well learn now, folks don’t just have off on their birthday.” What?! Are you kidding me? I remember feeling pretty frustrated with them over this. Actually I was downright mad. What difference did it make? When did I become a grownup and have to act accordingly? Maybe I had written a script that I was going to get my learner’s permit that afternoon. I don’t remember. But I do remember this lesson. It was perhaps one of the best lessons they taught me. The world does not revolve around me and my comings and goings, such as birthdays. Mama worked every one of her birthdays that I can remember. I mean, a house doesn’t shut down for someone’s birthday. Daddy worked every one that fell on a weekday. And when it fell on a weekend, he was not the type to kick back in the recliner and let everybody wait on him hand and foot. He did what needed to be done. I was thinking about this today when I read some words of wisdom shared by Hugh Hollowell. In his post, “The Important People,” he shares his father’s advice about jobs and life. I got to thinking about that critical moment when my parents taught me what it meant to have a job. Integrity. Loyalty. Giving it your all the whole time you are there. Would my boss have let me off for my birthday? Maybe so. But I’m glad I didn’t even get to ask her. I’ve thought a lot about what I want my daughter to learn, as she has her first job, the first in a string of many as she enters the real world of working and building a life for herself. I want the world and especially those who work with her to see the fabulous person I think she is. Most of the time. I want her to be loyal. When you work for someone or for a company, no words leave your lips that aren’t helpful or praising. If you have an issue about something, go through the proper channels. Complaining about it will not get you anything but a reputation as an unpleasant person. When you are on the job, they OWN you. And it’s okay, it’s legal. They are PAYING you. So whatever you are asked to do, outside of something that would lead to your being handcuffed, you are good–just do it. With respect. Do it with the same amount of energy and dedication, whether you love it or hate it. I even dare you to do it with a smile. Work when you are scheduled. With the exception of illness or death of a loved one, go to work. You might miss some stuff, but you know what? Dedication and applying yourself will pay off in the end. And I want her to know a job is a privilege. It is a privilege, not a right, to have a job and get paid to do it. We see so many people each weekend who would love to have a paying job that it makes me angry to hear anyone whining about his or her job on a regular basis. I’ve heard the saying that 30’s are the new 20’s. I’m cool with that, because that makes me…..well, much younger than I really am. However, if we continue with this math, we can get in trouble. Are the 20’s the new teens? If so, where does that leave our teens? Oh good gravy, where are we headed? I loved the show Friends. I watched it as a young married person. I watched it as a new Mama. I watch reruns occasionally now as Mama of three children, one almost in college. It was entertaining. Funny. My sister uses Rachel’s line “You’re so pretty” on a regular basis, and I still crack up. But here’s the thing. It is not the real world. I don’t know if the show led us where we are or if it was a reflection of where we, as a society, were heading; regardless, we are living in a world of young adults, many of whom don’t want to live in the real world. They feel cheated because they don’t have the life of “hanging out with friends” that the entertainment industry has led them to believe can be had. And I guess it can. But not if they want to have clothes to wear and a roof over their heads and food to eat. 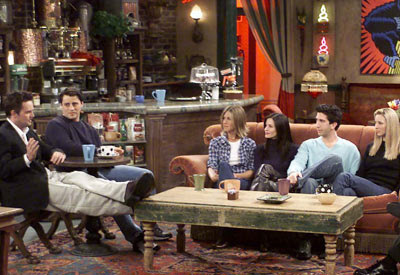 And those cups of coffee the gang had at Central Perk all the time–AIN’T. NO. WAY. I know some pretty awesome young adults. They are good people. Many of them have it together. But it is starting to worry me how many young adults today feel entitled to have their job working for them instead of the other way around–expecting the job to accommodate them and their schedule. Jobs that don’t let them study when things are slow are simply “being difficult.” I worked in a library, and reading a book was done only on my personal time. Jobs that don’t let them clock out early when things are slow–what is that about? I’ve even heard young people say that between working and going to school they are busy five days a week! *sigh* I don’t know what is happening, but I do know this. My seventeen year old is watching. She is watching television that makes her think her life should be much different than it is. AND she is watching the young adults in her life. And she is learning a lot. I’m just her Mama. What do I know? Daddy was right. Nobody’s going to help me raise these children. I’m trying hard to instill good work ethics and values in my young adult in the short time I have left with her, but I fear other voices might be louder. So I am asking those of you who have graduated from high school or college and aren’t still in school, if you haven’t already, please join the real world. Get a job and take it seriously. You’ll make mistakes. I sure did. But what I found was that when I humbly apologized and asked how I could right my wrong, more times than not, it all turned out okay. So yes, find employment. It might not be your dream job or where you want to be in five years. We’ve all been there. (Well, except for maybe Donald Trump, but I digress.) But whatever job you accept, give it your all–all of your energy, all of your positive attitude, all of your very best effort, and respect those in charge. Because here’s some wisdom I learned from my parents thirty years ago and it still rings true today. 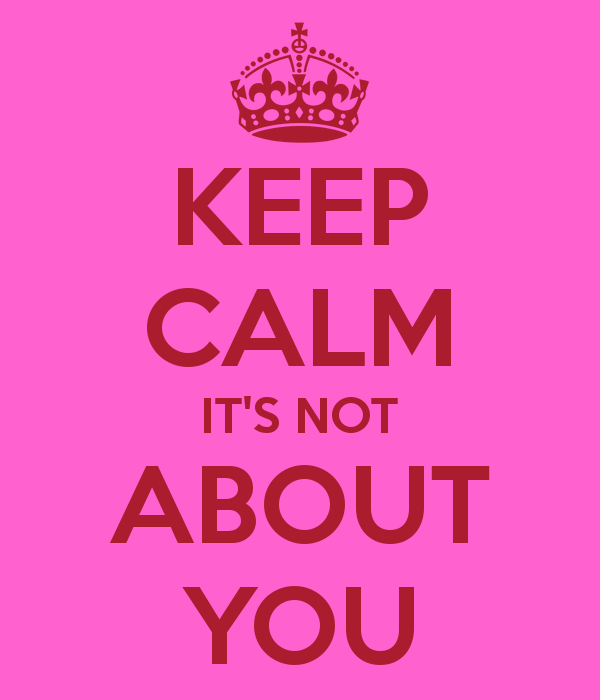 It’s not all about you. And please, just as I expect my teenager to set a good example for our littles, PLEASE set a good example for those younger than you. Let them learn from you what a good employee looks like. Because maybe, just one day, they’ll be working for you, and you’ll be glad you did. I finally got organized and stored my batteries in these rice jars. Those jars right there? The ones holding the batteries? Those make me very, very happy. Recently I decided to clean off and re-organize my cookbook bookshelf in my kitchen. 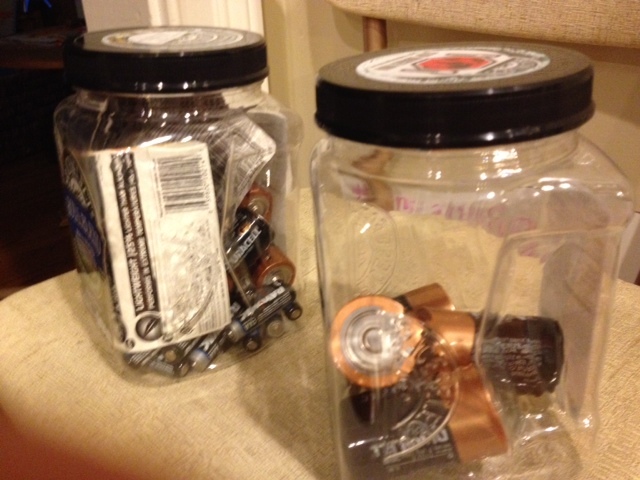 I was especially tired of the batteries rolling around out of their packaging all over one of the shelves. Because, you know, that’s where everyone stores their batteries–on the bookshelf with their cookbooks. That’s how my Daddy rolled. 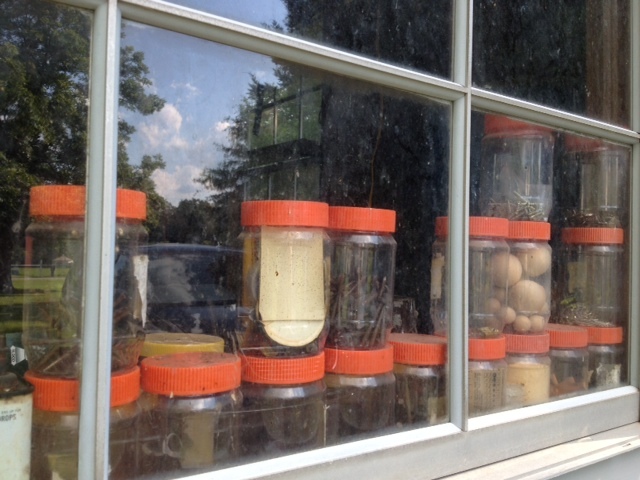 Over the years, as one of these jars was used, Mama would peel off the label, wash it up, and pass it on to Daddy who used it for any number of things out in his building. For those of you wondering, yes, peanut butter–Reese’s to be exact. It was the best. They had come a far cry from the days of Mama buying it in those big tubs with the plastic handles, the stuff that would separate so easily. Ah, yes, over the years Daddy became quite the connoisseur of peanut butter. This is not a paid endorsement–sigh–if only. This bookcase has had many lives too. It originally sat in our living room when I was little and it was black. When they moved this into the room I shared with my sister, Mama and Daddy painted it yellow. That must have been industrial strength stuff. It’s scary how well it has held its color over the years. And yes, my Daddy loved his peanuts. Just like with the peanut butter jars, Daddy would take the washed one out and use it for whatever he needed. 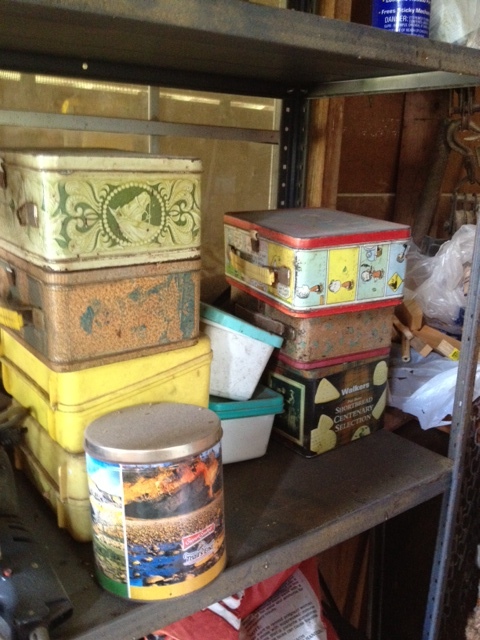 He even used our old lunchboxes and some old cookie tins. I am pretty sure that horse one and the Charlie Brown one saw me through most of elementary school (we didn’t have middle school back then). The Walker’s shortbread tin carries me back too. Daddy loved shortbread. He even made some one time. Delicious. I loved picking up a box of it around his birthday or Christmas or just because. I think that big tin must have come from Sam’s one Christmas. It occurred to me the other day when my brother, my teenager Auburn, and I were out in the building that some folks might have kept the lunchboxes for the value they might have one day. I don’t know that these didn’t have some dings or dents already, but regardless, I don’t think it would have ever occurred to Mama and Daddy to save something for later on like that. One of the things they impressed upon us the most was being a good steward–of the land, of our belongings, and of the people around us. Taking care of what and who we were lucky enough to have. They lived simply. If it didn’t have a use, they usually didn’t keep it. They were very particular about what they hung on to. When I was growing up, things didn’t go to waste. Leftovers were eaten at the next meal or two. Clothes were handed down to the next sister, and after that usually to a cousin or given to the Salvation Army in the next town over. We had “give away” days to clean out toys and outgrown clothes and the like. The pecans that grew in the yard were cracked, cleaned, sugared, and given as Christmas presents to teachers and friends. I remember we had a spider plant that Mama took cuttings from and carried up to the school for the Halloween Carnival store that raised money for the PTG. Mama patched our jeans when they tore in the knees. (This was way back before folks started paying extra for such as that.) When the jeans started high watering, they were cut off and turned into shorts. Mama and Daddy were thrifty. Very little went to waste. Tonight I am thankful for parents who raised me to aim to be a good steward. To look around at what’s here before I head to the store to get something new. My Daddy once told me I only needed three pairs of jeans and dared me to get rid of the rest. I haven’t gotten quite to that point, but I am trying. 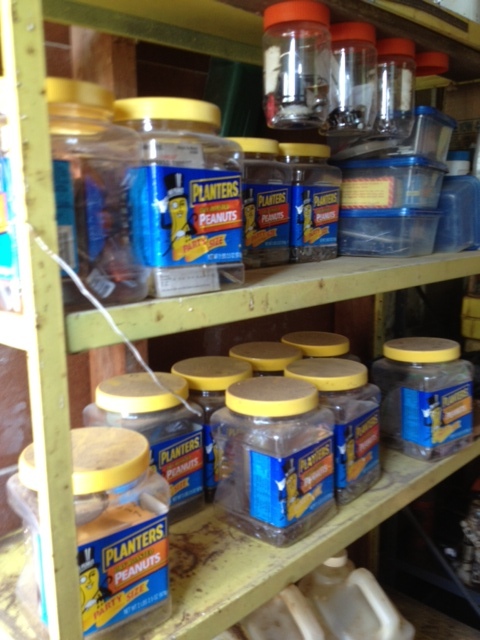 Tonight I am thankful for a reminder of where I came from and who I want to be…..all from some batteries stored in rice containers, cleaned out peanut butter jars, and an old yellow bookcase. The original recycling.